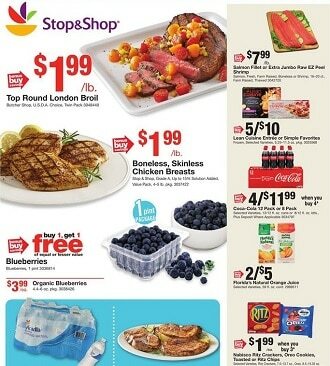 Find the Stop and Shop Circular, valid April 19 – April 25, 2019. Don’t miss the Stop & Shop Flyer Sale specials and grocery deals from the current Ad Circular. Save with flash sales and super savings for Fresh Italian sausage, Coca-Cola products, Nature’s Promise organic salad, Poland spring water, All laundry detergent, Wild Caught cod fillet, Pacific organic broth, Organic tomatoes or strawberries, Butterball turkey bacon, USDA Choice rib steaks, Ortega Mexican food products, Prego pasta sauce, Old Spice or Gillette deodorant, and more.